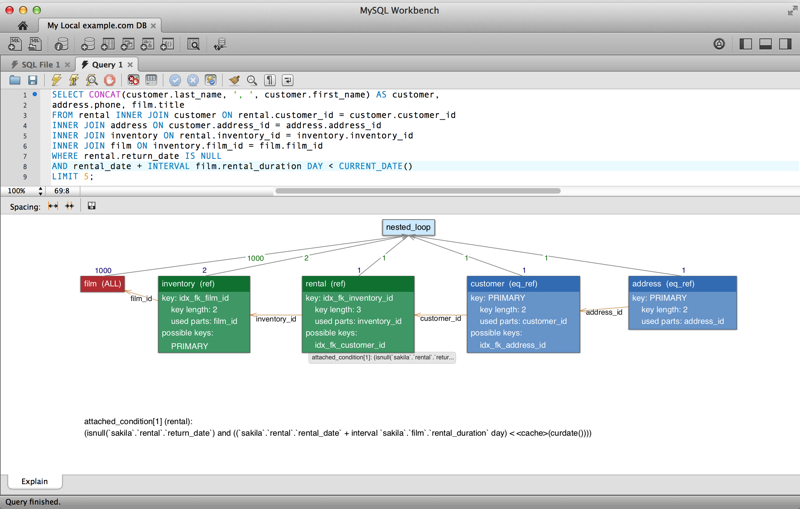 This section summarizes many of the new features added to MySQL Workbench 6.0, in relation to the MySQL Workbench 5.2 release. 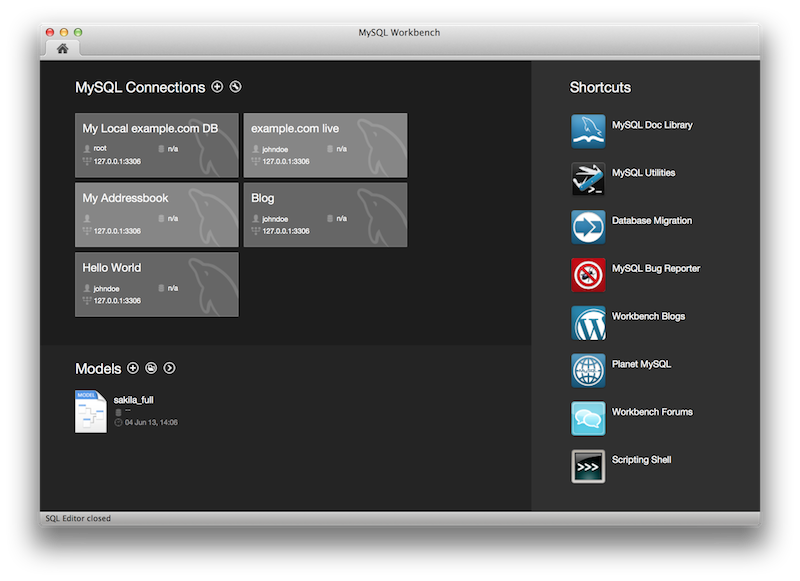 A new, modernized home screen where major functionality of MySQL Workbench can be accessed, including connections to MySQL servers, modeling, migration, and the command-line utilities. In the new user interface, the Server Administration functionality (such as start/stop server, managing user accounts etc) is now accessible directly from the SQL Editor interface, located near where the schema information can be browsed and queries executed. 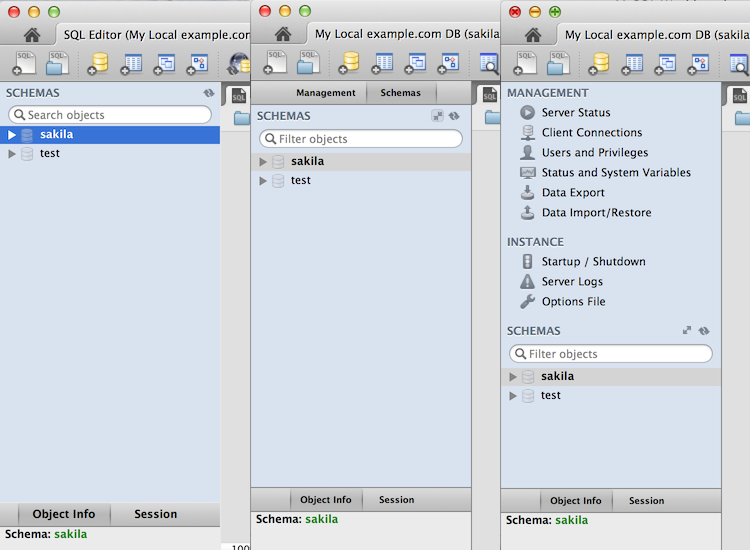 The following figure contains three screenshots of the Schema window in the SQL Editor. The first is from MySQL Workbench 5.2, the second is MySQL Workbench 6.0 with the management tab collapsed, and the third shows what the merged management tab looks like. Toggle the merged and tabbed views by clicking the new merge button next to the refresh button. You can select schemas, tables, or both to perform client-side searches for user specified strings and patterns. To access this new search feature, right click select a schema or a table in the left sidebar and select Search Table Data. 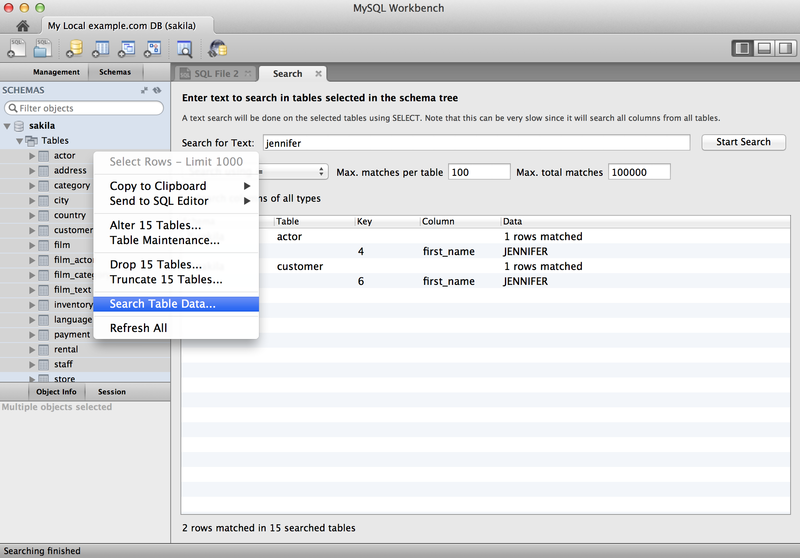 For additional information, see Section 8.1.8, “Table Data Search Tab”. Select a keyword or function in your query and after a delay it will show formatted help information from the MySQL Server (equivalent to using the help command from the command-line MySQL Client). 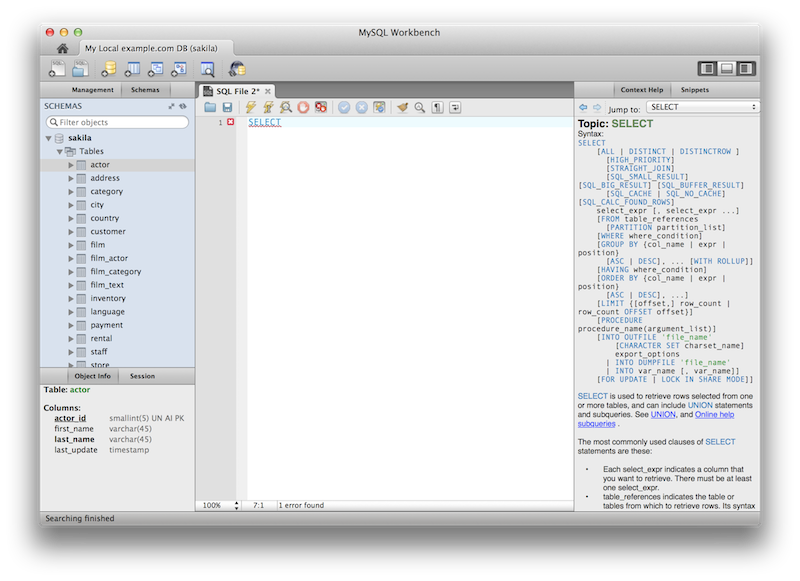 For additional information, see Section 8.1.6, “SQL Additions - Context Help Tab”. 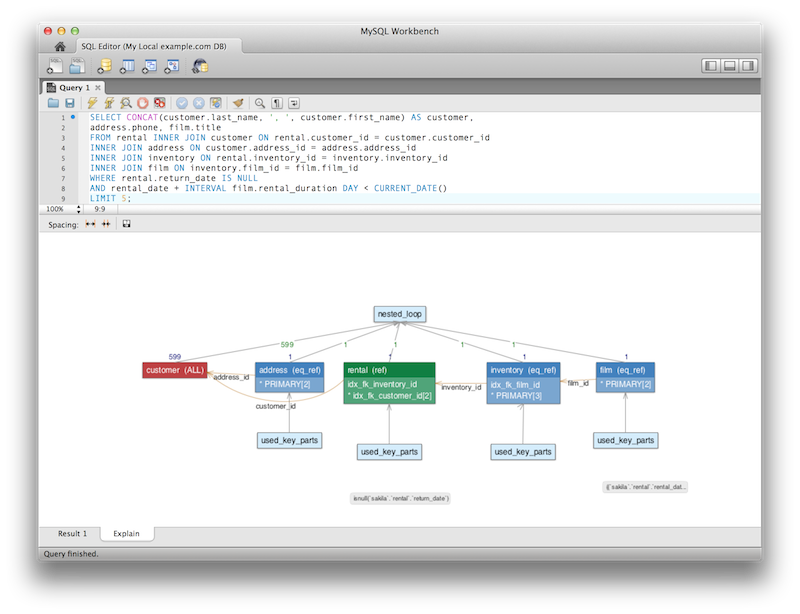 For additional information, see Schema Inspector. You can generate a series of DELETE statements needed to delete a row from that table, which includes rows from other tables that reference it, recursively. 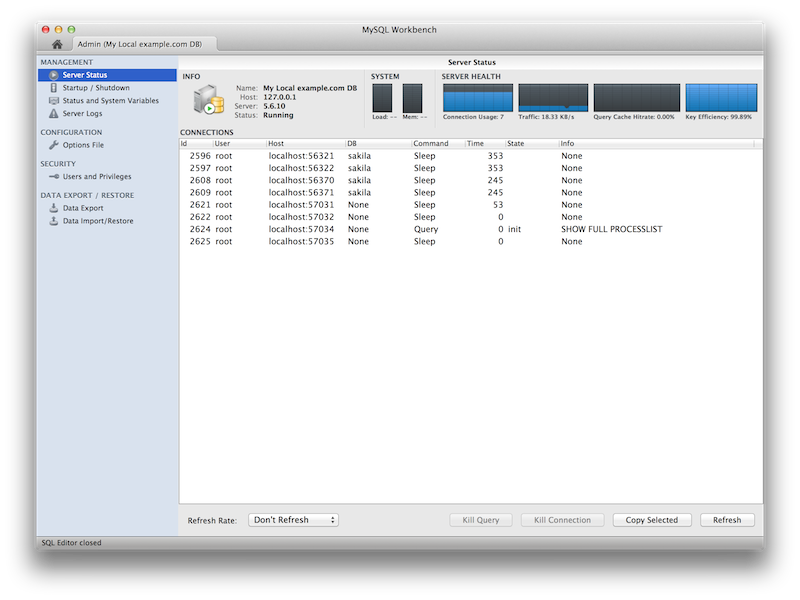 The SELECT version allows you to preview what rows would be deleted. Right click a table and select Copy to Clipboard, Delete with References. Define templates of tables with commonly used columns, to be used to create new tables in a live connection or in an EER model. 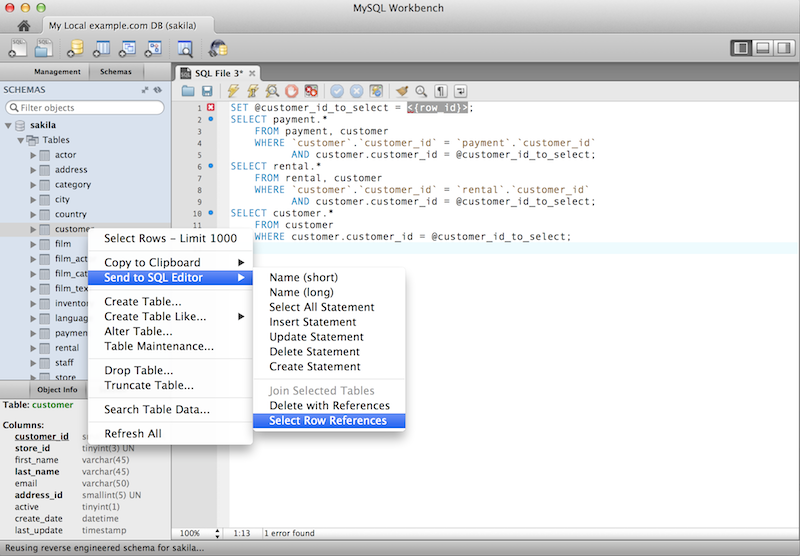 In the SQL Editor, choose Create Table Like, or in Modeling, use the right sidebar. For additional information, see Section 9.6, “Table Templates”. A Vertical Text output option for queries (equivalent to \G from the command-line Client) was added. 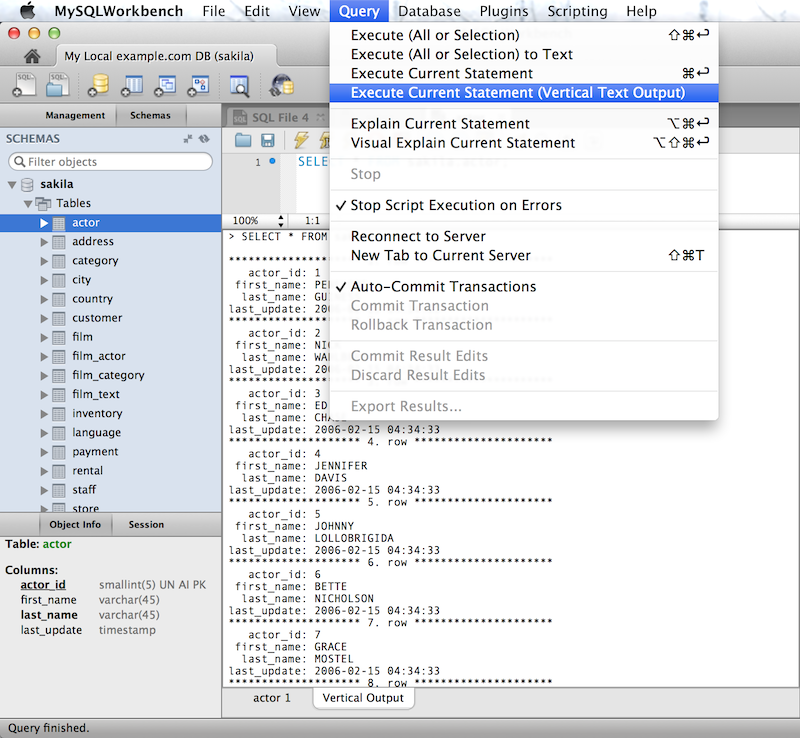 To execute, choose Query, Execute Current Statement (Vertical Text Output). The Visual Explain output was improved. Additional server status information was added, and the user interface was improved. Select Server Status from the Management tab to open this window. 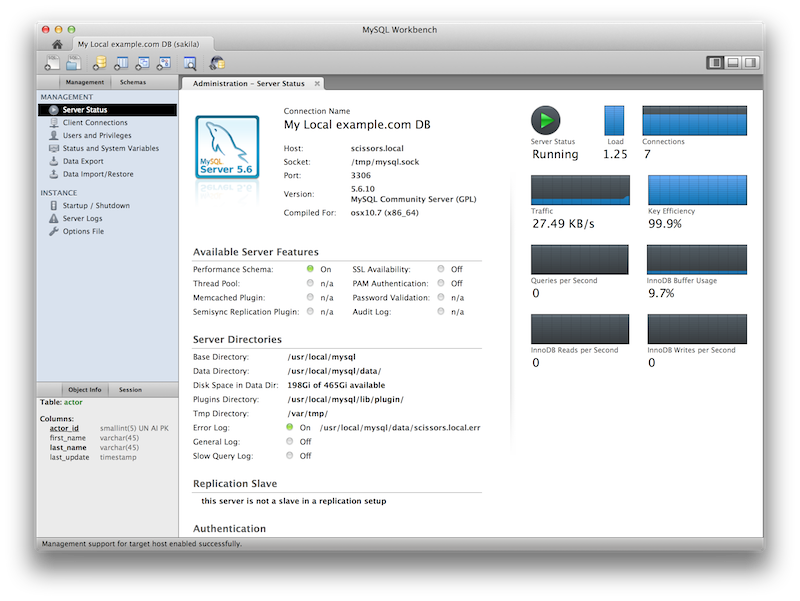 MySQL Enterprise Backup (MEB): A GUI front end for the MEB tool. 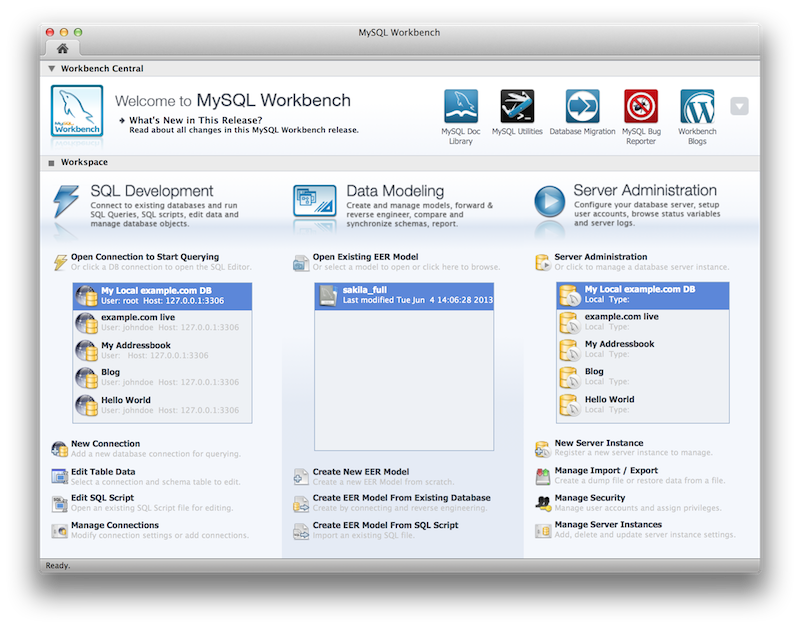 After installing a Commercial Edition of MySQL Workbench and MySQL Enterprise Backup, MySQL Workbench will check for and handle the prerequisites. Backup recovery is also supported. This plugin supports MEB with local and remote installations of Linux and macOS, and locally for Windows. 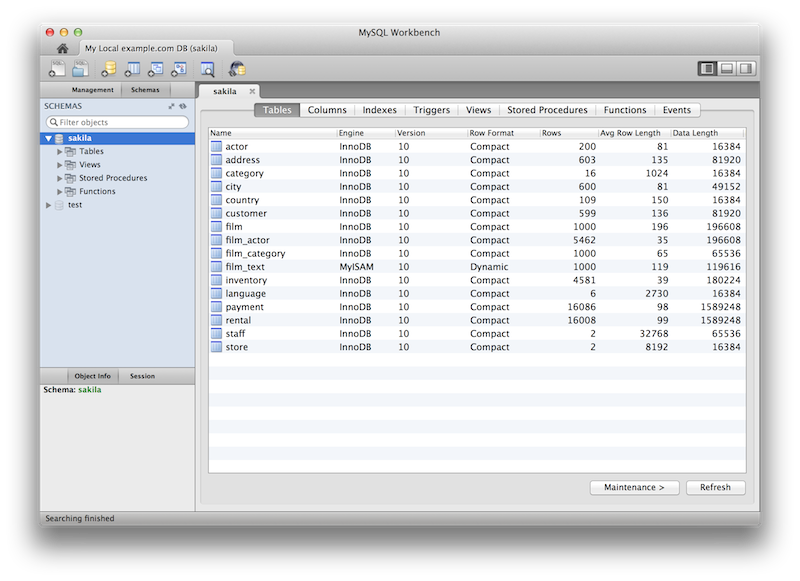 MySQL Audit Log Inspector: A GUI for browsing the contents of generated logs by the commercial Audit Log Plugin. Powerful filtering and search capabilities are available. Fast browsing is provided by caching the log data locally in an encrypted file. This plugin supports MEB with local and remote installations of Linux and macOS, and locally for Microsoft Windows. 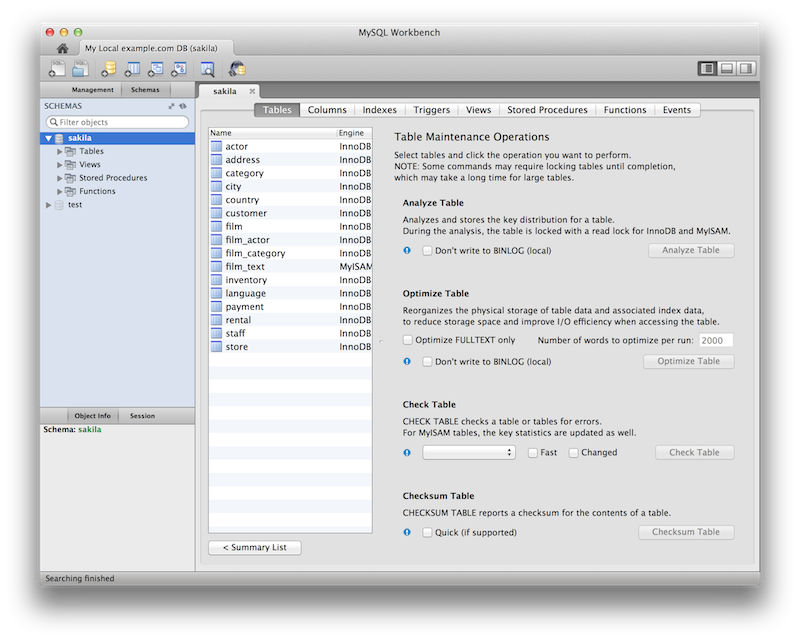 SQL Anywhere and SQLite are now supported.